The emphasis on inclusion of children with disabilities has brought about significant changes to how students with disabilities are able to access the general curriculum. Students with moderate to severe disabilities have historically been offered few instructional resources that provide such access and alignment with instruction offered in the inclusionary setting. With the advancement in technology, curriculum can now be universally designed in digital format while offering more ways for students to engage the learning process. This article discusses how pre-service teachers viewed the use of digital curriculum content with this student population. In particular, how pre-service teachers view digital curriculum developed using Intellitools Classroom Suite™ as a new and flexible instructional tool that can help meet the broad learning needs of all students including those with severe disabilities by offering improved ways to modify the curriculum. The role of the general curriculum with special education students continues to grow since the 1997 reauthorization of the Individuals with Disabilities Education Act (IDEA '97) also referred to as Public Law 105-17. This reauthorization required increased access to the general curriculum for all students with disabilities. This statutory requirement and the growth of technology allowing for specialized dissemination and engagement of instructional materials offers a host of opportunities and challenges for today's educators, especially those serving students with moderate to severe disabilities. The challenges often found in providing adapted or modified instructional curriculum for students with disabilities frequently limits opportunities to engage fully with the curriculum. The lack of modifications or scaffolding to support diverse student ability levels is in part a fundamental flaw in the traditional design of curricula found in today's textbooks. The lack of ease in which instructional curriculum can be altered, adjusted, modified, or scaffolded is in part due to the traditional print based format of the curriculum materials themselves (Hitchcock, Meyer, & Rose, 2002). The traditional print based format is one that no longer affords the flexibility needed to meet the many diverse instructional needs of today's students. A digital curriculum is one that does offer teachers the tools and flexibility to meet the growing diversity of student needs. Research in curriculum design for individuals with moderate to severe cognitive disabilities has historically been divided between the two domains of academic and functional skill development. Nietupski, Hamre-Nietupski, Curtin, and Shrikanth (1997) emphasize a balance between the social, functional and academic skills of students while still meeting the unique needs of the individual learner. Additionally, the main tool of instruction is through textbooks (Baker & Zigmond, 1990). Because printed text is viewed as the only viable way to convey information, students are left with only one learning tool. This poses a challenge for students with various disabilities in need of flexible learning experiences not available in the traditional printed curriculum. Historically, special education teachers have modified the curriculum to increase student success. Schumaker (2004) reported that 52% of students with disabilities receive some curriculum modification, 35% receive unmodified curricula, and 11% receive substantially modified curricula. Unfortunately, basic adaptation without individual and instructional engagement at the student level does not show promise. Baker and Zigmond (1990) found that traditional basal reading curriculum with teacher adaptations for special education students did not increase student achievement to acceptable levels in the context of learning disabled students. Conversely, a universally designed digital curriculum is now beginning to function as a truly flexible learning environment that works within and between regular and special education environments. This form of curriculum minimizes other problems commonly found in placement decisions that mandate more time in the general education classroom without sufficient attention to individual learning needs. A school curriculum offered in digital format should provide engaging activities that support and enhance the academic rigor currently found in today's standards based curriculum. It should also offer new and engaging instructional activities that bring to bare functional skill development often taught in self-contained classrooms. Digital Learning Vignettes (DLV) are one such way. Digital Learning Vignettes would encompass audio or video activities to support and enhance instruction aligned to the general curriculum. When presented in digital format, students of all ability levels have the opportunity to gain rich insight into new instructional content through flexible forms of instructional presentation using such examples as audio feedback or scaffolded text. Scaffolding formats include breaking a task into smaller more manageable parts. For example, breaking down as task or skill and verbalizing each part of the skill (Lipscomb, Swanson, & West, 2004). Accordingly, scaffold text might take on the appearance of text coupled with pictures, cues such as highlighting text for specific words, or visuals such as graphic organizers and outlines (Bradley & Bradley, 2004). By focusing the design and role of the curriculum as a tool for educating all students, not just the "average learner" one begins to see the potential of digital curricula. As a result of using the new instructional tools offered in a digital curriculum, designers now have the means to integrate learning opportunities suited to all students within one curriculum: a universally designed digital curriculum (UDDC). The UDDC may well serve as a truly flexible learning environment that works well within and between regular and special education settings. The UDDC would minimize many problems found in placement decisions that might emphasize more general education classroom time without closely planning for individual learning needs. The importance of student engagement in the learning process is paramount for students with severe disabilities. Dymond and Orelove (2001) note that too often we base instruction upon developmental levels focusing on drill and practice that may incorrectly provide insight into prerequisite skill sets. This mindset may also promote a "deficit model" within the classroom for learning and achievement. A balance between teaching functional and academic skills through new curriculum models should be explored. Learning through an engaging, developmentally appropriate yet flexible curriculum would allow students of varied skills, both disabled and non-disabled to receive instruction to meet their needs. The wide range of student abilities found in today's classroom is vast and complex, placing greater demands on teachers and the traditional curriculum they present. Thus, with a more flexible curriculum and learning environment, the student has more opportunities to connect with his/her unique cognitive style. Dymond and Orelove (2001) raise the important point that balance needs to be achieved between academic and meaningful skill instruction. Of note, is it possible to instruct students in the general education classroom in ways that meet the academic needs of regular education students and functional needs of those with severe disabilities? Brady (2000) argues that more factual or rote learning should be linked to real-life applications for all students to promote academic and meaningful skill development. While that guiding principle may lead to more meaningful learning, the notion of providing academic content within real-life application should also take into account the need for a flexible learning environment in order to for student to achieve better learning outcomes. Curriculum has been defined as "the overall plan for instruction" that is used within a public school (Hitchcock, Meyer, & Rose, 2002). In order to provide instruction, teachers are expected to provide meaningful content in a way that that helps students learn. However, as observed by Davis and Krajcik (2005), "teachers' use of, and learning from, text-based curriculum materials depend not only on the characteristics of the curriculum materials but also on the type of teaching activity in which the teacher is engaged, (sic) the teacher's own knowledge and beliefs (e.g., about content, learners, learning, teaching, and curriculum materials), how those beliefs are aligned with the goals of the curriculum." (p .3). Curriculum developed in digital formats allows for student interaction, engagement and customization. Anderson-Inman (1998) notes the ability to rapidly send flexible digital content over the Internet to students for large-scale dissemination, engagement, and ease of access. This begins the first steps toward individualized learning controlled by the student and no longer dependent upon extensive teacher modification or alteration. The student gains access to the general curriculum through individual engagement based upon specific learning needs. Edwards (1996) outlines a set of guiding principles for curriculum developers to consider which may increase engagement and improve student learning opportunities. Table 1 has been adapted from Simmons, D.C., Kameenui, E.J. (1996, p 16) summary of critical dimensions of curriculum design principles. Studies have revealed that all too often, instructional modifications are seldom made during the instructional program (Gunter, Denny, & Venn 2000, Fuchs & Fuchs 1998) even for student with mild disabilities. Of the modifications that are made, lowering expectations on the learner is the major choice. Other modifications include extended time, alternate curriculum and assessment formats, 1:1 assistance, etc. (Sereci, Scarpati, & Li, 2005). Fuchs and Fuchs (1998) noted that few teachers offered altered instructional approaches to their lesson delivery. Rather, most favored adaptations lowering the expectations of the learner. With these challenges facing teachers working with the students with learning disabilities, educators should consider new approaches to curriculum presentation for all students including those with moderate to severe disabilities. Bremer, Clapper, Hitchcock, Hall and Kachgal (2002) advocate the use of universal design principles to increase access to the general curriculum. Given the complex instructional needs of the student population, a flexible digital curriculum encompassing universal design principles would allow teachers to easily alter their delivery without sacrificing solid instructional practice or high expectations. This paired with new flexible digital curriculum materials would allow teachers to finally begin to meet the varying instructional needs of their students in realistic ways. Wehmeyer, Lattin, and Agran (2001) added that students with mental disabilities should be afforded high expectations the same as all students. The authors noted that one avenue of accomplishing this was through directly requiring increased access to the general curriculum in IDEA 97 by way of inclusion of students in states standards based reform efforts and accountability systems. The instruction presented to students with moderate/severe disabilities is all too often limited in its alignment to the general curriculum. The balance between heavy reliance on functional skill training and traditional academic instruction is often lacking. This is due in part to a gap in available curriculum that can meet broad ability levels using a single source. Brown, Branston, Hamre-Nietupski, Pumpian, Certo and Gruenewald (1979) note that few curricular materials are designed for the moderate/severe population. They continue by stating that non-disabled students' curricular content typically centers on the areas of reading, math, language arts, social studies, and physical education. Students with cognitive disabilities often are presented curricula organized around basic skill areas of communication, cognitive, social, motor and self-help. Furthermore, Dymon and Orlove ( 2001) and Nietupski, Hamre-Nietupski, Curtin, and Shrikanth, (1997) conducted research on curriculum development and found similar issues. Curriculum development strategies and content should have sufficient flexibility to allow the full range of students' abilities to align closely to the new universally designed digital curriculum. Scaffolding is one such curricular support. Scaffolding offers instructional supports for learners at various levels in the curriculum to simplify concepts while gradually removing supports as concepts begin to crystallize. Dabbagh (2003) described scaffolding as providing assistance to novice learners by minimizing concepts and extraneous material in the learning context and then gradually removing these limits as learners gain understanding and confidence through the learning process. Given the broad curriculum demands and wide range of performance ability students present, curriculum designers would be well positioned to offer more flexibility in their instructional content being offered in digital format. The focus of the pilot study was to examine the factors involved in the design and utilization of a digital curriculum for students of all ability levels with emphasis placed on access to the general curriculum for those with moderate to severe disabilities. Teachers were given digitally created instructional activities using software from the Intellitools Corporation (IntelliTools Classroom Suite™) and asked to rate these based on a number of variables. IntelliTools Classroom Suite ™ is an electronic curriculum-authoring tool that allows professionals to develop present and assess concepts, instructional material and a variety of information for students using a variety of media and presentation modes. IntelliTools Classroom Suite conforms to the principles of universal design for learning—multiple means of representation, expression, and engagement—to help students who are struggling with challenging concepts in math, reading, and writing. The tools incorporate multimedia modeling, animation, and auditory support to assist students with challenging concepts. They take advantage of the infinite patience of the computer to provide as much time and practice as each student needs. IntelliTools Classroom Suite supports the different ways students become engaged and motivated, whether through speech feedback, larger text, or the use of color. Students also benefit from instant natural feedback, and teachers can keep track of student progress. Educators still tell us about their great classroom experiences using IntelliPics. IntelliTools Classroom Suite now incorporates many of the popular IntelliPics design features. The new Easy Explore Setup, reminiscent of IntelliPics, makes it easy to add pictures, movements, and backgrounds and adjust numbers and colors. IntelliTools Classroom Suite makes lessons come alive on an interactive whiteboard, giving teachers a powerful and engaging classroom tool. 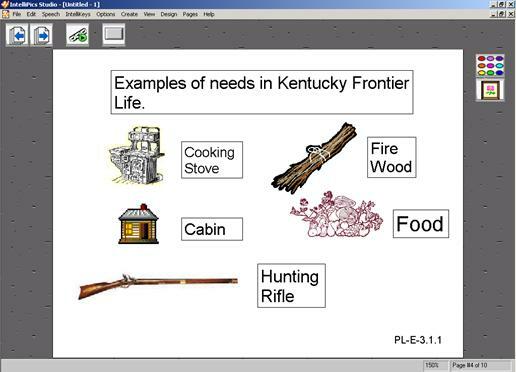 With the software projected onto a whiteboard, teachers can demonstrate lessons and model activities for the classroom. Students can then participate by touching the screen for hands-on critical skills practice. Students can also participate from their seats, accessing whiteboard activities with alternative devices such as IntelliKeys or IntelliSwitch, for a truly inclusive classroom experience. The software has the ability to offer a wide variety of methods and formatting to enable learners to gain greater awareness of literature, reading, math, science, etc. The software is one example of providing electronic curricula that would meet the guidelines of UDDC and enable teachers to effectively instruct students. It is with this in mind that we developed the study to determine teachers' evaluations of the six thematic curriculum activities aligned to Kentucky's Core Content (4th grade U.S. History). The study utilized a survey instrument composed of a Likert style rating scale. The initial draft was developed by the co-authors. Subsequently, two other faculty members reviewed the survey for clarity and face validity. The survey was piloted on two students in the graduate program at the college that were full-time teachers. Revisions were made relative to format and clarity. Seventeen multiple-choice questions were presented. Each question was rated on a 1-5 scale as seen by the participant with 1 being "I strongly agree" and 5 being "I strongly disagree". 1. I feel comfortable installing software on my computer. 2. I had difficulty installing the Intellitools software. 3. The software and activities were installed on my school computer. 4. I did not see how these activities aligned to state standards. 5. The activities were appropriate for classroom use. 6. The visual presentation of these activities were not appealing. 7. These activities were instructionally meaningful. 8. These activities were no more engaging than traditional textbooks and classroom activities. 9. My students engage more with computer-based content than my regular classroom activities. 10. I could use these activities for student assessments. Directions were explained at the top of the questionnaire with basic demographic information requested. All questionnaires were completed anonymously and returned using a self addressed stamped envelope or email. Teachers were initially mailed a letter explaining the purpose of the study to solicit their interest in participating. Those expressing an interest as a substitute for a class assignment were mailed a questionnaire, a CD ROM of digitally created instructional activities, and installation directions. The directions provided instruction on the review process and the questionnaire itself. The directions also detailed the software installation process and technical issues that might arise. Once completed, questionnaires were to be returned to the evaluator for analysis. In the class that was composed of 23 students, 19 participated in the study for a response rate of 83%. Demographic information revealed the majority of teachers with 1-3 years teaching experience (see table 3). The participant pool also revealed that of the 19 completing evaluation questionnaires, 16 were female and 3 were male teachers of students with moderate to severe disabilities. Even though teachers were predominantly new to the teaching profession (1-3 years), an intermediate to advanced comfort level with technology was indicated. This may reveal improved technology training components offered in teacher preparation programs or heavy reliance on technology in moderate/severe classrooms necessitating technology self-reliance. Table 3. Years teaching experience. In the area of software competency and usage, respondents were asked to rate their skills. Specifically, they were asked to rate their comfort level loading the software required to view the curriculum activities developed for the study. Of the 19 respondents, over 94% stated they felt comfortable to very comfortable installing the required software on their computer. When actually installing the software, only 10.5% indicated they had difficulty with the installation process. Conversely, 89.5% of those responding indicated that they had no difficulties. Of those teachers reviewing the activities, 63.2% indicated that they did not install and review the activities on their school computer but rather their home computer. Teachers that did install the software and activities on their school computer were 36.8%. This dimension examined issues related to curriculum appropriateness for this population. Instructionally, 94.8% of the participants indicated that they did clearly understand how these curriculum activities align to the national curriculum standards. Of the 19 participants, 100% indicated that they "Strongly Agreed" or "Agreed" that the curriculum activities were appropriate for students with moderate to severe disabilities. The visual presentation style of the digital curriculum activities was also examined. Participants (89.5%) indicated that the curriculum activities would be appealing visually for their students. The instructional dimension examined the curriculum quality and overall engagement of the content and supporting activities. Instructionally, the activities were gleaned meaningful by 100% of those evaluating them for use with moderate to severely disabled students. In particular, 36.8% of the participants stated they "strongly agreed" the activities were meaningful with 63.2% stating they "agreed" the activities were meaningful. When comparing these computer based curriculum activities to more traditional textbooks or classroom activities, 78.9% of the respondents indicated that they believed the activities were more engaging than traditional print based activities used for instructional purposes. Ten percent of respondents felt the activities were no more engaging than traditional textbooks or activities with the remaining 10% undecided. In relation to technology, 47.3% believed that computer-based content was more engaging for their students in the instructional process. Interestingly, 42.1% of respondents stated they were "Undecided" if they believed computer based content was more engaging compared to regular classroom activities. Over 10% of teachers indicated they did not believe computer based content was more engaging for their students. Consistent, high quality assessment practices challenge many special educators working with students. Respondents (84.2%) indicated that they could use these curriculum activities for assessment purposes. Most students with moderate/severe disabilities are often assessed using alternate portfolios, which could include these assessment activities as technology demonstrators. Only 5% were uncertain of how the activities could be used for assessment purposes with 10% indicating they could not use the activities for student assessment. Interestingly, only 10% indicated they had the knowledge or ability to modify or improve the activities for enhanced student assessment. A vast majority (89%) did not believe they could or were unsure how to modify the activities. A host of general instructional needs arise when developing universally designed curriculum models. A large number of teachers did indicate that the curriculum activities would be accessible for students with physical disabilities (73.7%) while 10% felt the activities were not accessible. Interestingly, 89.4% of respondents indicated that the curriculum activities would work well with both regular and special education students collaborating together. To the contrary, only 5% were undecided or did not believe the curriculum activities were appropriate for regular and special education students working together. The various presentation formats (Text, Speech, Digital Images) used through the computer based curriculum activities met different learning modalities according to 89% of the respondents. Ten percent of respondents stated they were unsure if the activities met various learning modalities. In regard to learning the content presented in the curriculum activities, 63% of the participants indicated they believed their students could learn the content. Twenty six percent were unsure if their students could learn the content, while 10% felt their students could not learn the content. In regards to using the materials again, 84% indicated they would with 5% undecided. Ten percent of the participants indicated they would not use these curriculum activities again with their students. A small percentage (10%) felt the curriculum activities were not as engaging as traditional textbooks or activities. This may convey a need for balance in the use of various curricular materials in the educational process. In relation to technology, 47.3% believed that computer-based content was more engaging while 42% were unsure. This reveals a rather high percentage (42%) still may not see the larger role of digital curriculum as a flexible learning tool in the classroom. As more research becomes available and product development improves, higher quality universally designed digital curriculum resources will continue to be refined and offer to further individualize flexible learning. While 63% of the participants indicated they believed their students could learn the instructional content as presented, 26% were unsure. This indicates a continuing need to train new and current teachers on instructional delivery techniques using digital curriculum that integrates with the general curriculum in such a way that all students participate at high levels. Twenty six percent of those responding were unsure if their students could learn the content while 10% felt their students could not. High expectations are essential in our quest for student success. By offering curricula in flexible digital formats teachers or students can alter the curriculum to meet varying cognitive abilities. In the future, research should explore instructional design models that encompass universal design curriculum principles and offer easily identifiable controls to adjust curriculum content levels through such methods as scaffolding, adapting materials and others. Teacher training should also be explored in the context of skills needed to integrate digital curriculum resources directly into the instructional process. General education teachers use of technology should also be studied to determine their skills and capabilities in an electronic or universally designed curriculum. Allington, R. (2002). What I've learned about effective reading instruction: From a decade of studying exemplary elementary classroom teachers. Phi Delta Kappan, June, 741-747. Anderson-Inman, L. (1998). Electronic text: Literacy medium of the future. Journal of Adolescent & Adult Literacy, 41(8), 678-82. Baker, J., & Zigmond, N. (1990). Are regular education classes equipped to accommodate students with learning disabilities? Exceptional Children, 56, 515-526. Brady, M. (2000). The standards juggernaut. Kappan, 81, 648-651. Bremer, C.D., Clapper, A. T., Hitchcock, C., Hall, T., & Kachgal, M. (2002). Universal design: A strategy to support students' access to the general education curriculum. Information Brief: Addressing Trends and Developments in Secondary Education and Transition. National Center on Secondary Education and Transition. 1(3), 1-5. Brown, L, Branston, M. B, Hamre-Nietupski, S., Pumpian, I, Certo, N, & Gruenewald, L. (1979). A strategy for developing chronological age appropriate and functional curricular content for severely handicapped adolescents and young adults. The Journal of Special Education, 13(1), 81-90. Dabbagh N. (2003). Scaffolding: An important teacher competency in online learning. Tech Trends, 47(2), 39-44. Dymond, S.K., & Orelove, F.P. (2001). What constitutes effective curricula for students with severe disabilities? Exceptionality, 9(3), 109-122. Fuchs, L.S., & Fuchs D. (1998). General educators' instructional adaptation for students with learning disabilities. Learning Disability Quarterly, 21, 23-33. Gunter, P.L., Denny, R.K, & Venn, M.L. (2000). Modification of instructional materials and procedures for curricular success of students with emotional and behavioral disorders. Preventing School Failure, Spring 116-121. Individuals with Disabilities Education Improvement Act of 2004. (IDEIA) (2004). H.R.1350. U.S. Department of Education's Office of Special Education Programs Retrieved March, 2005, from http://thomas.loc.gov/cgi-bin/query/z?c108:h.1350.enr. Intellitools. (2002). IntelliPics Studio [Computer Software]. Petaluma CA: IntelliTools Incorporated. Intellitools. (2000). Intellitalk II [Computer Software] Petaluma, CA: IntelliTools Incorporated. Nietupski, J., Hamre-Nietupski, S., Curtin, S., & Shrikanth, K. (1997). A review of curricular research in severe disabilities from 1976-1995 in six selected journals. The Journal of Special Education, 31, 36-55. Rose, D. & Meyer, A. (2002). Teaching every student in the digital age: Universal design for learning. VA: Association for Supervision and Curriculum Development. Simmons, D. C., & Kameenui, E. J. (1996). A focus on curriculum design: When children fail. Focus on Exceptional Children, 28(7), 1-16. Sireci, S. G., Scarpati, S. E., & Li, S., (2005). Test accommodations for students with disabilities: An analysis of the interaction hypothesis. Review of educational research, 75(4), 457- 490. Wehmeyer, M. L, Lattin D., & Agran M. (2001). Achieving access to the general curriculum for students with mental retardation: A curriculum decision-making model. Education and Training in Mental retardation and Developmental Disabilities, 36 (4) 327-342. Simmons, T., Bauder, D., Abell, M., Penrod, W. (2008). Delivering The General Curriculum: Pre-service Teacher Perspectives Regarding A Technological Approach For Students With Moderate And Severe Disabilities. Information Technology and Disabilities E-Journal, 12(1).